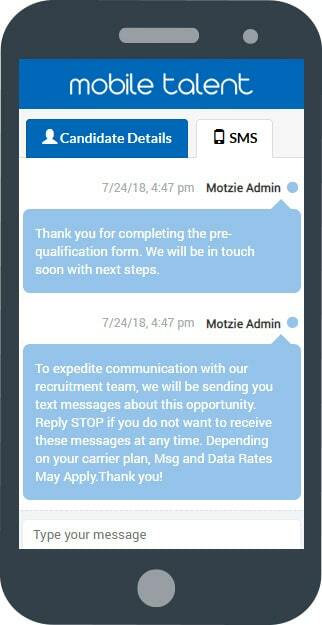 Imagine connecting with your candidates the moment they submit their details, while they're most interested. Mobile Talent's SMS Communicator is the fastest, most effective way to instantly communicate with your best candidates! The average candidate SMS message is read within 5 seconds. 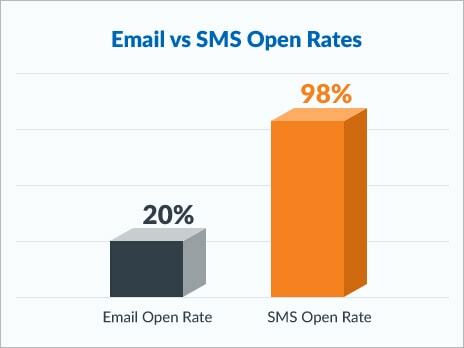 And, 98% of SMS messages are opened and 40% are read, vs. less than 20% of email messages. Enjoy a 45% increase in candidate response rates with Mobile Talent’s built-in SMS Communicator. With rates like that, why rely on email and outbound calls alone? Initiate and maintain candidate communication with flexible SMS tools that balance personalization with efficiency. Take your recruiting to the next level using the latest SMS Chatbot which leverages AI for more effective, "intelligent automation". SMS Communicator enables recruiters to engage more candidates via any mobile job microsite campaign. How does SMS Communicator work? SMS Communicator adds a unique mobile number to any job campaign. All communication is stored within the Mobile Talent campaign, and candidates can opt-in or opt-out at any time. SMS Communicator enables real-time candidate communication via short text-messages, giving recruiters unprecedented control and access to their candidates. Recruiters are instantly more efficient and engaged with their best candidates. Messages can be easily personalize to drive the best response rates. Quickly Turn Candidate Leads into New Hires! Communicating with candidates using SMS makes it easy to source, qualify and engage the best talent in the shortest amount of time. Plus, SMS Communicator shows candidates that hiring companies are "with the times" and willing to engage them in ways that are convenient and effective, creating a positive brand first impression.